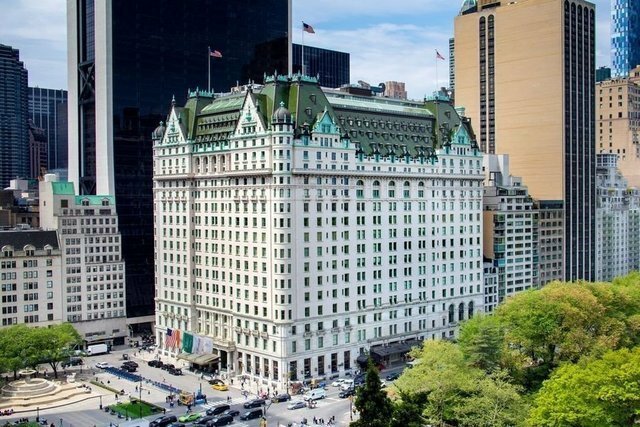 Welcome to the Plaza Private Residences at the legendary Plaza! This fully renovated and serene home is a perfect pied-a-terre and a peaceful oasis in the busy city. The impeccable renovation carried out by Costas Kondylis and Partners LLP replicates the original Kondylis Plaza designs, with the finest craftsmanship and beautifully restored pre-war details to make a stunning statement of classic style and elegance. The residence features 1 bedroom, 1.5 baths, 11-ft ceilings, oversized windows, hardwood oak flooring throughout, Living room with a double exposure and a generously proportioned Bedroom. The Master bathroom is outfitted with double sink, soaking tub and a glass-enclosed shower stall and includes the original mosaic pattern derived from the historic Plaza lobby, white tiled walls and the classic fixtures with Plaza insignia. The apartments oversized south facing windows overlook the Plazas landscaped garden, fountain and reflection pools. The Residences have a separate entrance and Landmark Private Residential lobby with a 24/7 concierge and doorman and enjoy full Hotel services and amenities, including room service, maid, valet, limousine service, spa, salon and gym.This apartment could be purchased and combined with unit 1101.Showing by appointment only with a 24 hour notice.